﻿ The Leela Raviz Kovalam (India) | FROM $119 - SAVE ON AGODA! 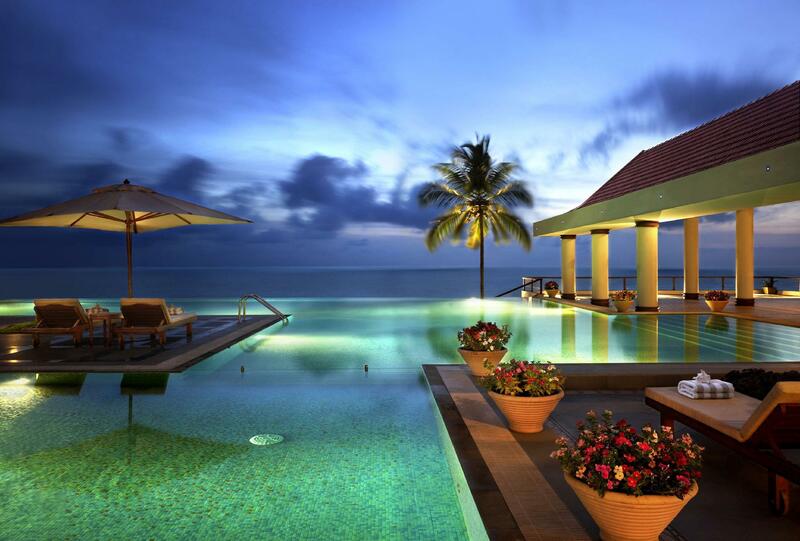 "This is a fantastic place to vacation or get together with f..."
Have a question for The Leela Raviz Kovalam? "The location on the ocean was gorgeous and the private beach clean." "Breakfast was excellent - so much choice." "Property is located in Good Location." 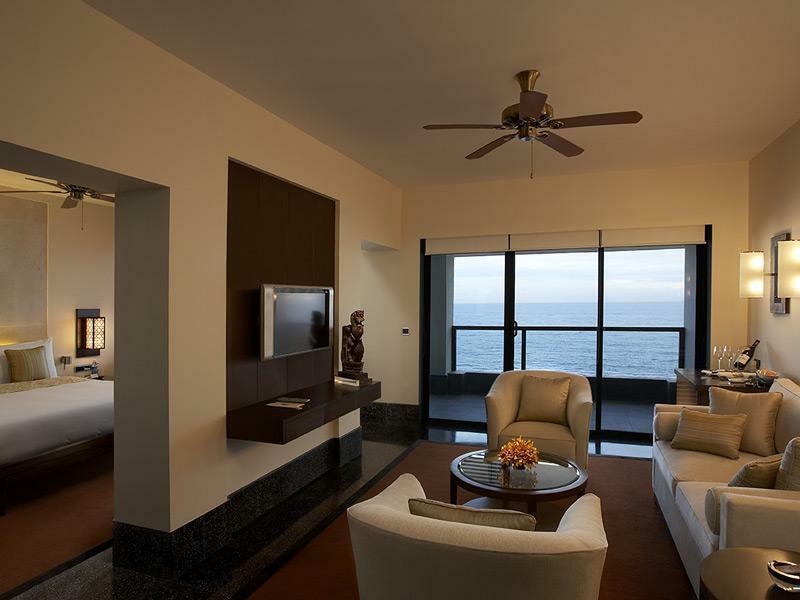 The Leela Raviz Kovalam is a cliff top property that guarantees uninterrupted sea views from all rooms without exceptions. Just 13 kilometers from the capital city of Trivandrum, the luxury resort feels a world away from the noise of the city. Exploring Kovalam is easy with numerous tourist taxis, or if you are feeling a little adventurous, why not hire a bike? Guests have access to a private beach, yoga lessons, and a host of excursions and day picnics. A trip to Kerala is not complete without its famous Ayurvedic treatments, and the on-site Divya Spa does just that - luxurious massages in an exotic setting. Dining at the resort is an experience in itself, with jaw dropping views along with scrumptious dishes. 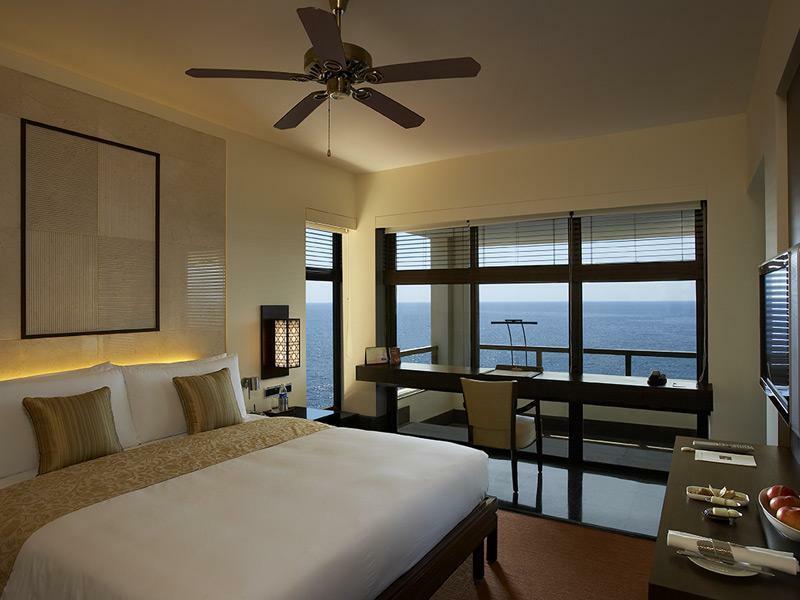 The rooms, the food, and the view at The Leela Raviz Kovalam is without a doubt an experience that will be difficult to forget. "Staff is very hospitable both at front desk and terrace rest..."
Please note that the 1st of every month and certain other days as notified by the Government are designated ‘dry days’ and the sale and service of liquor is prohibited in the hotel as per law. According to government regulations, the first of every month, Sundays and certain other days will be designated as dry days. The sale and consumption of alcohol will be prohibited in all public areas of the hotel on these days. Beautiful property with excellent location. The setup and view from the resort is worth the trip. The weather was not suitable during the time of our travel. Food was average and not 5 star standard. Top staff, top location, top value. Very helpful and observant staff. Service leaves no whishes open. The pool is located in the restaurant area, can be seen as a disadvantage for women in "western" bathing clothes. 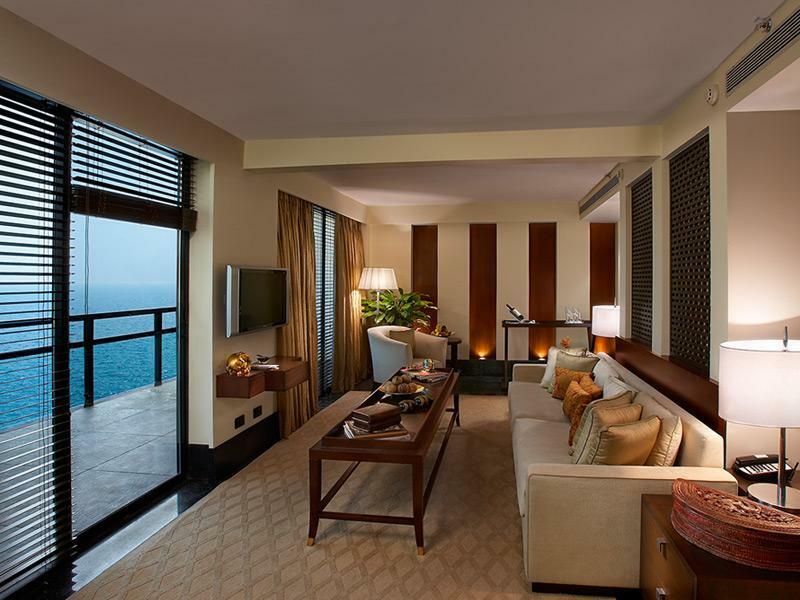 Chose to stay at The Leela Kovalam after staying The Leela Ambience, Delhi. Although we had an exceptional experience in the Delhi sister hotel, our experience here didn't quite hit the mark. Overall we did have a pleasant stay but there is major room for improvement in the following areas:- 1. Staff - While the staff from the front desk to the restaurant are polite they need to brush up on their guest relations and be inspired to serve better with efficiency and speed. Guests must not only experience the luxury amenities but also experience the welcoming warmth and hospitality of the staff. The Leela Ambience, Delhi was able to provide this in abundance. We would recommend placement of staff in the Delhi sister hotel to learn and develop in this area. 2. The crows at the Terrace were an annoyance to the peaceful surrounding. There should be a systematic effort to resolve this. Apart from the above we would return to Leela Kovalam should we make another trip there. Spent three nights at The Leea on Kovalam beach in Kerala , India . The hotel is located on the water with a fantastic view . The food and service is excellent . The staff goes to great lengths to meet all your needs . In spite of the location , transportation to the City and other points is easily available . I recommend the Ocean View rooms . The Garden View rooms are a hike from the main hotel where all the facilities are . This is a fantastic place to vacation or get together with family and friends . First of all, I have to commend Mr Sanjeev on his professionalism and fantastic customer service. We were given an upgrade to a Beach View Room and surprised with a cake for our wedding. The security staff were very helpful in regards to arranging time and location for our photographers to shoot our wedding photos. The staff were very friendly and courteous and the rooms were large, spacious and fashioned in a traditional Kerala style architecture. Room service was very efficient and food was quite exquisite. The rainfall shower head was not working and neither was the bathroom fan. There is a nice bar on the side of the hotel that overlooked the ocean and drinks are reasonably priced. We did not use the gym but it looked well equipped. Early checkout at 6.30am and Airport drop off was charged. We were given packed breakfasts which was a really nice gesture. It was a most pleasurable stay and we will definitely be coming back. very pleasant stay in a beautiful hotel. the level of staff is excellent. buffet dinner costs about with a variety of foods. the private beach is nice. the view from the hotel of the beach is spectacular. but only a few room have a bath tub so you need to request at the booking. we cannot find any negative point about the hotel. we want to come again. The lobby, restaurant and main pool were stunningly beautiful. The rooms, while clean and comfortable, were underwhelming in comparison. The location on the ocean was gorgeous and the private beach clean. This was our most expensive five star hotel in India. For over $280 a night we were placed in a room at the furthest end of the resort with no view - not even the garden. As is typical in India, the staff were great. We had a garden room - I’ve seen lots of reviews complaining about them but I thought it was lovely. We just walked up to the building instead of getting a buggy - only takes 5 mins. Breakfast was excellent - so much choice. We had idli and sambar, appams or masala dosa and they were all good. It’s annoying you can’t get a glass of water without having to pay though. The bar was ok (serves alcohol - rare for Kerala!) but we found the Ibiza-bar-style music annoyingly loud. The happy hour isn’t offered unless you ask for it, so do that! Beds comfy, shower good, the private beach section is a little odd (next to public beach, and it feels a bit odd/uncomfortable when locals are shoo-ed away). These are just observations not complaints - it was all generally amazing and a real treat. The Leela is a fantastic place to stay at. It has everything that you would want in a resort, lush open spaces, great views and scenery and excellent staff to attend to all your needs. The rooms were large and clean and had all the amenities that you could require. The only thing that could really be improved is the speed of the service. Food and drink took a really time to come and the food also came quite cold. There is nothing worse than tucking into a cold bowl of mushroom soup. Great place nonetheless and always looking forward to coming back. the hotel is very big and with facilities with baggies, in general the service is good but slowly, the food is excellent. we have a problem with a segurity of the club (Apollo) because he tell as shut up , really very bad education but in genaral the service is friendly. The finest property in the area ,would definitely want to go again and again,they went out of their way to provide us a room immediately on arrival say with 30-4 mnts at about 10:00 am though they were not obliged too but they did and I cannot thank them enough for this. but the only problem is not with them alone but entire state regarding the liquor hours . The are loosing out heavily on tourists. Otherwise a great place . Went there after 33 years and refreshed the memories. Thanks one and all for a splendid time and hope to make it sooner than before . Property is located in Good Location. Although the Private Beach and Seafood Restaurant is a mess. Stayed at the Club so was expecting better service standards but was surprised with the ordinary/rude behavior of the staff. Had asked for a quite rooms that only happened after a lot of back n forth with the staff. Room were changed but didn't have a working Minibar, Telephone and had Dusty Blinds and Shades. Food including service at the Club Cafe was great (only good part during my stay). Staff at the Terrace Restaurant were Rude. Club rooms come with luxury airport transfer but I only got an Innova sighting reasons of unavailability despite specifying my requirements way in advance. For the kind of service receievd, don't think this place is worth the money. It would have been good to have information about the cultural show that takes place every night. We only found out towards the end of our stay. A member of staff should be allocated on arrival to convey information about location, facilities available and other relevant details. Great hotel We booked 5 bedrooms with sea views. Excellent location, fantastic swimming pool, good food, friendly staff. Only a few negatives which should not stop anyone booking. Some problems with rain coming into one of the rooms (2314) but the hotel refunded the cost of that room. Wifi chargeable even in lobby area which is not ideal. Some of the bulbs in the rooms were fused. having stayed at 12 hotels during my 20 days in india, found the service a bit disapointing although location, embience and layout was great.. sometimes i wonder whether the fact we were indians had something to do it with. the check-in staff were great. room service was great but generally did not feel warmth in many other areas. even on the beach, my son was asked to move out of the private area.. very important to recognise your guests then assume they are all local..beautiful hotel though! Leela was disappointing on several points: - I have stayed in the Leela in Banglaore and this was not in the same class - During check-in, we were asked to wait without explanation whilst it appeared that the check-in staff milled around - Staff at check in and spa were fairly cold and impersonal - none of the Keralan warmth we felt throughout the 17 day trip we had experienced - On the last day we had a huge corporate group running around the hotel shouting and talking very loudly unnecessarily, behaving very boistrously - We could not get a late checkout on the last day due to our flight leaving late that night. WE soon realised that half the guests were in the same boat. One would think that the hotel realizing that most foreign guests fly out late at night due to most flights are scheduled to leave Trivendrum late in the evening would cater to this group of guests - The bathrooms near the gym were ill -equipped to cater to guests like us who had no room for the last day and were dependent on that toilet - it was humid and hot and not air-conditioned, bathroom lights in the ladies toilet were not working, there were no towels.